COLOMBO, Sri Lanka (CNN) -- Sri Lankan authorities on Saturday detained a British news team that produced a report about allegations of abuse and ill-treatment of Tamil refugees. 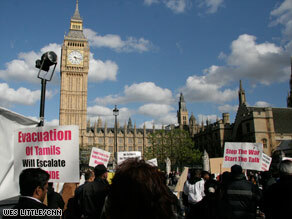 Protesters demonstrate in front of British Parliament in support of Tamil rebels in Sri Lanka. Three journalists from Channel 4 were seized and handed over to Sri Lanka's Criminal Investigation Department for interrogation, police spokesman Ranjih Gunasekera told reporters. The report, aired Tuesday on Channel 4, chronicled the alleged abuse of Tamils in internment camps in the city of Vavuniya in northern Sri Lanka, where fighting has raged between government and rebels. The report alleged that "dead bodies were left where they fell, shortages of food and water, and sexual abuse," ITN says. The government denied the claims. Asia Correspondent Nick Paton-Walsh, a cameraman and a producer were arrested by police and were in the process of leaving the country, Channel 4 management said. Paton-Walsh's visa was canceled, the Web report said. Channel 4 said the team -- which had been in the country with valid visas and had been reporting there independently for a couple of weeks -- has been told to leave the country. "We will be seeking an explanation from the Sri Lankan government for this decision," an ITN official said. Tamil Tiger rebels have been fighting for an independent state in Sri Lanka's northeast since 1983. As many as 70,000 people have been killed since the civil war began, and the group has been declared a terrorist organization by the European Union and more than 30 countries, including the United States. Sri Lankan government troops have pinned down Tamil Tiger rebels in a small section of the country's north. Civilians trapped in the crossfire have been attempting to flee.